Their Barcelona World Race has proven a challenge above and beyond that of some of their rivals. Seasoned Hungarian veteran Nandor Fa and hard driving, young Kiwi Conrad Colman formed their partnership just weeks before the start, setting off round the world on an IMOCA 60 which was designed by Fa and had only just been finished. Their only crew training and testing was an upwind delivery slog to Barcelona from Trieste. When the start gun sounded they had still never gybed a gennaker together. And the last week, at least, has been devoted to the relentless rhythm of the gnarly, Pacific, when 30kts starts to feel light and 35-40kts the default norm. Hence there will be enormous satisfaction aboard Spirit of Hungary when Fa and Colman cross Cape Horn tonight. They are definitely looking forwards to the release, to the change of regime, whatever the Atlantic may bring, but Colman for one says he will miss the malevolent majesty, the ever present threat, of the south Pacific.
" Raw… Beautiful… Furious. It is hard to find a word to sum up our circumstances at the moment. We are brushing the top of probably our last real Southern Ocean depression and for the past 18 hours have had wind of 40 knots, gusting 45 to 50. The swells, big for weeks now have grown into mountainous seas. Easily 8 to 10 meters in height with lofty cornices blown higher by the storm force gusts, they tower over us and curl to break noisily in a thundering crash. Here, speed is our friend because as the waves pull up the stern we slide away from the breakers like a lithe dancer, but this is a dancer fighting for its life. Spirit of Hungary is tired and creaks and groans and burys its bow in the trough between the waves. After all the sail patches stuck, stitches sewn, blood spilled, sweat dripped and sleep missed while we have been down in the cold southern latitudes it will be a relief to turn the corner and make it back into the relative safety of the Atlantic. Instead of endless seas and gliding birds we will again be surrounded by tankers and cargo ships, flying fish and ports of call. Despite all of that, I will be sad to leave these frigid unfriendly waters. Its empowering to pass point Nemo and shout out to the world, knowing that there is no one and nothing to echo back. In our modern era it is truly rare to be totally self reliant and responsible for whatever circumstance that may arise. There’s that side and also the beauty of Nature in the raw." The Hungarian-Kiwi duo will be the final Barcelona World Race partnership out of the Pacific and into the Atlantic. Race Direction in Barcelona, who maintain a 24/7 vigil watching the seven dots pass across their screens, also probably will give quiet thanks for a safe passage through the Big South. 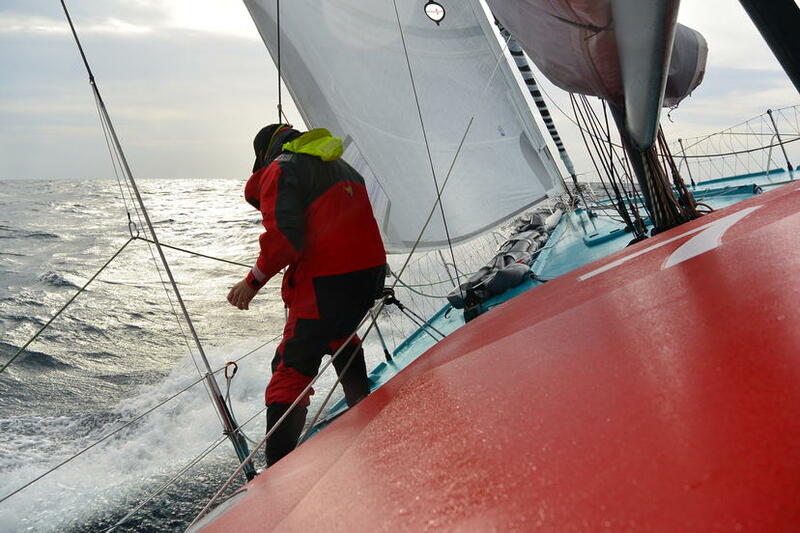 Neutrogena became the second boat back into the Northern Hemisphere last night, crossing the Equator at 22:18 UTC. Guillermo Altadill and José Muñoz may have passed five days after Cheminées Poujoulat, but now at just 601 miles behind Bernard Stamm and Jean Le Cam, that can be more like two to three good racing days. GAES Centros Auditivos will become the third boat across, passing into the north this evening. Neutrogena have made back more than 900 miles on Cheminées Poujoulat in the last week. GAES Centros Auditivos have correspondingly reduced their deficit behind Neutrogena to just 134 miles. Somewhat remarkably after 74 days and something like 21500 miles of racing, rivals We Are Water and One Planet, One Ocean & Pharmaton can see each other in the South Atlantic. The theoretically slower One Planet, One Ocean & Pharmaton has gone from being a slightly distant threat to We Are Water, to having the real potential to overtake. Aleix Gelabert and Didac Costa reported today that they could see the IMOCA 60 of Bruno and Willy Garcia on their port bow. "We enjoy the pressure and this race is making our days shorter. We live each day very intensely and so we like it. There is a race, they are doing well, and we are trying to keep them behind us, but it won't be easy." " To be honest it is difficult to say because we have not had a lot of luck with the weather. We have to fight day to day as it comes because we don't really know what the key is, the Doldrums, Gibraltar, the last miles on the Mediterranean? We don't know. In sixth place Renault Captur has said goodbye to the South. As Sébastien Audigane and Jorg Riechers said this morning "Last night, the sunset, an albatross came by and seemed to say goodbye ... At least this is what I like to think. The 40s left in our wake, water temperature gradually increases, we enjoy some sun in the Atlantic and soon enjoy a good shower ". Bruno Garcia (ESP) We Are Water: " We are Mediterannean people and so we cope better with the heat than the cold. Clearly we are feeling better as we go north. "We enjoy the pressure and this race is making our days shorter. We live each day very intensely and so we like it. There is a race, they are doing well, and we are trying to keep them behind us, but it won't be easy. To be honest it is difficult to say because we have not had a lot of luck with the weather. We have to fight day to day as it comes because we don't really know what the key is, the Doldrums, Gibraltar, the last miles on the Mediterranean. We don't know. We have had very, very nice conditions to come north in the South Atlantic. And for the next few days we have calm weather, and afetr that we should have the trade winds, the SE trade winds, so the conditions should be quite nice. But right now we have a lot of rain. It is like Brittany. We have had a shower, it was great. You always have a moment here and there to think about finishing, the arrival in Barcelona, that happens all the way through the race. We are not so obsessed about that, we set short term goals, Cabo Frio latitude, the Doldrums, things like that. So we are living step by step. The main things are all OK. We have a lot of small things to repair, because we only had two months to prepare, I suppose.